That's what you're supposed to do. Before you get to the end of your slate course, measure ahead about 8 to 10 feet and see if you will need any adjustment. If so, add an eighth inch or whatever between each slate. No one will notice the adjustment from the ground when you're done. What you did worked! Amen and Amen! I happily, have not been leaving gaps between my slates! BUT, my planning was not perfect either because, I started in the middle and worked out. I also wanted 1 1/4 inch overhang on the end. When I got toward the side I realized that in order to have my overhang I would have to leave a small gap of about 1/8 inch between the last 8 or so slates. So, I did that because of the conversation below. If this had happened before the conversation below I would have paid extra for a larger slate on the end. So instead of having a 12 X 18 it might have been a 13 X 18. What I did looks fine too and you can't tell by looking at it. How would you have handled this situation? Here's a photo of a newly installed slate roof in New Orleans installed by a reputable and experienced slate roofing company (Durable Slate). I inspected this roof for the owner and found the installation to be excellent. Note that the slates are not gapped. They're not supposed to be. Contractors telling you that roofing slates need to be visibly gapped should not be installing slate roofs. If you look closely, however, you will see small gaps between most of the slates anyway. This is what naturally occurs when laying slates. There is no effort made, however, to intentionally leave a gap. I am about to have 8"x12"x3/8" slate tiles installed on the roof of my traditional, French-style house (this afternoon, in fact). To keep with the style of the house I'd like the joint spacing to be as small as possible. If I use a 1/16" joint spacing or no spacing, the installer has warned me that the tiles will crack due to expansion and contraction in Southern California which is a dry climate with occasional rain. Is this true? Although I prefer 1/16" spacing or no spacing, would 1/8" spacing prevent possible cracking? Is expansion and contraction of slate a real problem in Southern California? Thanks in advance for your help! Jane, have confidence. You are doing a better job than a lot of the "professional" roofers out there. You have a great resource in all of us here and we want you to succeed. You are not afraid to ask questions and it is a joy for us to answer them. The pictures help a lot too. Keep up the good work. Most the time if you are using, one size slate you need to snap vertial lines up the roof, or referance line. Make measurement below and above the dormer. This will all depend on the size of the slate. Jane, it is all math. Allow for an 1/8 of an inch between each slate and strike your lines. Every 8 slates would be 97 inches if the slates are 12 inches wide. Extend the lines across the roof and trust them. good luck! So, when you have a 36' wide roof with 3 dormers how do you figure the correct pattern for the slate after each dormer so that the slate matches properly once higher then the dormers? How much do you add to your calculations to allow for a gap or, for no gap? See I would thing if the slate was tigther (With no 1/8" gap as suggested.) together it would lay more uneven, which would give you small gaps like the product (Slate Spaces). The gaps would provide more venting under more of the slate, which should dry the slate quicker and provide a longer life roof. The gaps are so small you don't see them for the most part or the top of the slate may be up a little instead of the bottom. The gaps are also so small that it don't create any repair or water protection problems. If you want a more uniformed look you should gap the slate as suggest to keep a more consistant shadow line. But depending on the slate, wher may be more then just gaping the slate. Whith NC Black slate who provides in my mind one of the best slates out there, you get very consistant slate which some peolpe don't like because it looks to fake. I see slate roof put on in CO through NES CO with NCB that look unreal. There is alot more to making a slate roof look good in the shadow line to, if the slate isn't consistant, it will be up to the installer to install the rigth thickness slate next to the same thickness slate or a thinner one, or a thinner one next to a thicker one because of the way the course below that one is laying, or what ever the case may be. I personally like the Slate Spacer idea of vent the slate and not bring tigth. Thought I'd jump in here. It sounds like most of us end up with the slight gap whether it is intentional or not. In my mind, the most important reason to leave a nice gap is to improve the shadow lines between the slates on the roof. It allows slate to be "all it can be"! From a technical point of view, the joint provides a capillary break against water moving up under a continuous, tightly laid, course of slate. 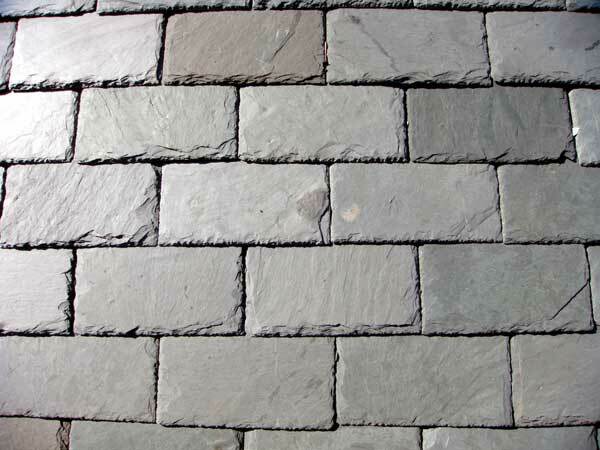 This may not lead to leakage, but does slow the drying time of the underside of the slate after each rainfall. This will lead to a reduced life for the material. It is worth noting that in the U.K. it is a contravention of code and considered poor slating when a consistent joint space is not present. It is definitely not intended as a practice that offers a "short cut to success or a warranty fall back" for people who don't install slate everyday. I think its a spec partly to help with people who don't install slate every day. This gives them something to go by that should make less to not problems for warrenty issue or installation problems for NC Black or any company that specs that tip. Never intentionally 'spaced' slate. Never had a problem. Not sure why I should start. It seems that just the minute irregularity in the pieces (out of square) creates some minor (1/16" to 1/8") gaps on its own. Even large-scale restorations with lots of salvaged Monson slate ("perfectly" squared units) has gone off without a hitch. What is the "binding" you refer to? We do not space slates when installing them. However, there is a natural space that occurs between them anyway as they are not intentionally pushed tightly together and then nailed. They are laid down, set against the other slate, then nailed. The focus is on the chalk line, not the adjacent slate. Typically, this leaves a small gap, maybe 1/16". If we had to consciously space every slate, it would add unnecessary and, I think, unreasonable time to the installation. To worry about gapping slates is to squander installation time needlessly. Yes, some poor installers overlap slates side to side, but this is simply gross error. North Country Slate states in it's publication NCS Standard of fall 2005, Vol. 1 Issue 1 on pg. 3--under installation tips "...instead of butting your slate together in the course, lay them with a 1/8"X3/16" "joint width". Veteran installers frequently use the pointed tip of their slate hammer to gauge this distance and slide the next slate across to the hammer tip to achive it. From a practical point, the common complaint that slates are binding together, or even worse, are overlapped in the course is avoided. More importantly the roof will shed debris and dry better than when the slates are butted together. MOST importantly, look how the spacing improves the shadow lines of each slate and enhances the overall appearance of the roof." Then it says to check their "Tech Support" section at their website for a downloadable CSI 3-part Specification that addresses this point. I'm still searching for the best way. Thanks for your help. Deflection maybe......If the structure and decking isn't stout enough? What is the purpose of the gap? Does North Country give an explanation? You can lay them right against each other and it won't hurt anything, but I will normally leave them slightly apart. If the slates vary in size at all and have to be repaired or replaced, it is easier to have a bit too much space than a bit too little. I have seen some methods of application for a old barn roof where they wanted to ventilate the barn that had the slates spaced about 4 inches apart. The rain came down, but the air was always moving out of the gaps and venting the area beneath it. Kind of slick to see. Can anyone tell me if slates should be tight against each other or should there be a joint width of 1/8" to 3/16th inch between slates lying next to each other in a course when installed. North Country Slate had this tip in it's installation guide?? Is there any reason one way or the other to leaving a space?? ?